FAQs 1. Can I have my printed circuit boards (PCBs) in a choice of colours? Green, Blue, Black, Red and White. FAQs 2. Can I get my printed circuit boards (PCBs) in different thicknesses? Printed circuit boards come in a variety of thicknesses to accommodate a multitude of products and requirements. Standard thicknesses include 0.4mm to 1.6mm in 0.2 steps, as well as 2mm, 2.4mm and 3.2mm. FAQs 3. What is the smallest printed circuit board (PCB) I can have? Printed circuit boards are used in a variety of electronic products and therefore can be manufactured in a number of sizes. Board sizes vary, dependent on customer requirements with the smallest board that we have made being only 5mm square, for a miniature medical device. FAQs 4. What is the largest printed circuit board (PCB) I can have? We make panels to suit your requirements, ranging from 5mm square through to 450 x 300mm (18 x 12 inches), which is the largest size panel we can produce in-house, as standard, which has a useable area of 17 x 11 inches. We also work with a number of reliable partners that make much larger boards if required. FAQs 5. What is the smallest hole size achievable on a printed circuit board (PCB)? The final diameter of the hole, also known as finished diameter, in a PCB is determined after plating and surface finish. The smallest finished hole size is 0.2mm and will be specified by the PCB designer. FAQs 6. Can you do complex curved outlines on your printed circuit boards (PCBs)? 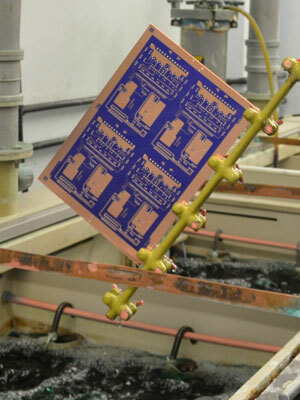 There are a number of processes used to create printed circuit boards. Using a CNC routing machine we can profile any shape required, including curves, slots and cut outs. FAQs 7. Can I have my printed circuit boards (PCBs) left in a panel for assembly? 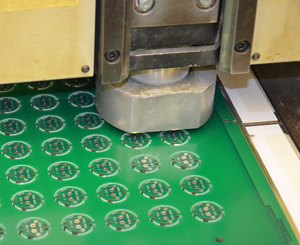 For the assembly process, some machines have a minimum limit to the size of PCB they can handle. For most sizes of circuit board we therefore supply panels with an array of several PCBs left in the panel, either by scoring or routing out with pips. Both options have the benefit of aiding production assembly, as there is far less handling and the boards on the panels are more suitable for assembly equipment. FAQs 8. 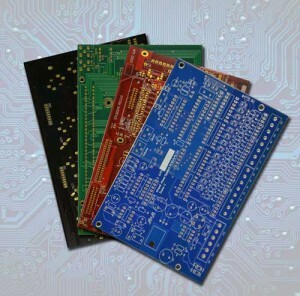 Do you offer a variety of PCB finishes? If copper is left unprotected, it oxidises and becomes unusable. The finish which is applied to protect the copper also primes the PCB surface on the pads, ready for soldering. The other PCB coatings we offer to special requirement are Electroless Nickel Immersion Gold (ENIG) and Immersion Silver. FAQs 9. How quickly can I have my Printed Circuit Boards (PCBs)? By manufacturing in the UK and investing in our PCB production process, we are able to offer an express, same-day service for your urgent prototypes. This means your manufactured PCBs can be ready within 8 hours from start to finish, from receipt of Gerber files. Our standard lead time is 5 days – one of the fastest in the UK. FAQs 10. 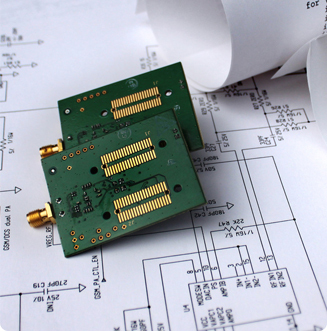 What instructions do ABL Circuits need before manufacturing Printed Circuit Boards (PCBs)? Photographic film (referred to as photoplots) used in the production of PCBs, requires Gerber files. 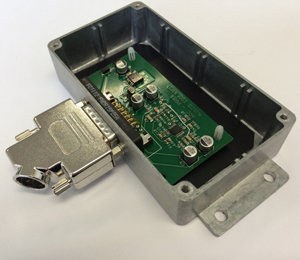 These can either be supplied by yourselves or we can produce these based on your circuit diagram and component list, by providing a CAD layout in house. 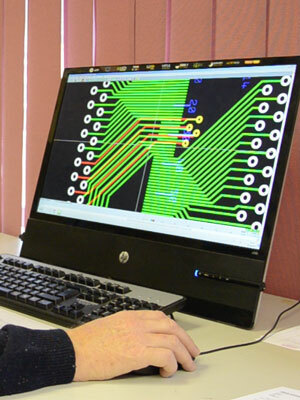 We can also design PCBs based on existing circuit boards or historic designs. We have a strong reputation for reverse engineered printed circuit boards too. Tooling holes are very accurately punched at either end of each film. These locate with the drill pattern on a tooling system so that everything lines up exactly for the CNC drilling operation.